First piece of White Chicks dating advice: Never settle for salad. Whether you’re a romantic or skeptic, Valentine’s Day is a time for indulgences. Not limp leaves. Thanks, Marlon. Fortunately for the generous souls picking up the check, love is in the air and so are the deals. For a more intimate experience, dine in The Den at Azabu Miami Beach. The hidden 11-seat sushi counter is offering a special Valentine’s Day menu for those who want to experience traditional Omakase. Bagatelle Miami Beach is celebrating with a special “All You Need is Love” menu. In true Bagatelle fashion, the party starts when you walk in with a welcome glass of champagne. The four-course meal that follows features shareable plates like agnolotti pasta with black truffle, whole stuffed Maine lobster, and a vanilla raspberry rosewater sorbet with meringue kisses. Spend the day in the heart of Coconut Grove’s Peacock Park at Glass & Vine, which is offering a Tasting for Two with an additional wine pairing option. Guests can enjoy a complimentary glass of bubbly alongside tuna tartare with raspberry, pickled shallot, dried black olive and herbs; semolina pasta with a black truffle cream, caramelized corn and grana padano; Angus beef short ribs with whipped potato mousse, mushrooms ‘a la Plancha’ and smoked wine jus; and Nutella “fondue” accompanied by strawberries, marshmallow, banana and vanilla cookies. ETARU will offer a premium Chef’s Tasting Menu, offered at both of the restaurant’s South Florida locations. Guests will be greeted with a signature Valentine’s Day cocktail, the Lipstick Rose (Oxley Gin, grapefruit, rose, lavender, topped with champagne), followed by five courses of ETARU’s most popular dishes. These plates include Black Kampachi Sashimi with yuzu truffle dressing, mizuna and pickled vegetables; Lamb Cutlets with Korean spices and cucumber; and American Wagyu Beef Rib Eye with eryngii mushrooms and wasabi ponzu sauce, ending with ETARU’s instagrammable dessert platter. From February 10 - 16, enjoy 20 percent off all couples spa services. Indulge in specialty treatments like Body Glow Exfoliation, a full body chocolate scrub made from Exquisito Chocolates, and Glacce massages with Rose Quartz. Throw in some complimentary champagne and signature truffles and we’re sold. Couples can also enjoy a romantic evening on the terrace at Bird & Bone. The special prix-fixe menu features a welcome champagne cocktail followed by a four-course menu that includes Vegan Roasted Heirloom Strawberry, Crab & Uni Dumplings, 28 oz. Angus Porterhouse Steak, and Tableside S’mores. You can also treat yourself during dinner to a glass of rosé and Exquisito Chocolates for $15. Between January 29 and February 14, book a Valentine’s Package and receive breakfast for two, a bottle of prosecco, assortment of Chocolate truffles, a complimentary upgrade to Deluxe Accommodations (based on availability), and early check-in / late check-out. Reservations: Be sure that promotional code SVP appears in the Corporate/Promotional code box when making your online reservation, or call (844) 319-3854 and ask for promotional code SVP. Step into Vista for a romantic evening with unbeatable ambiance, live music, and Italian-inspired cuisine with a Miami twist. In addition to their regular menu, guests can indulge in a four-course San Valentine menu with prosecco. Start off with creamy scallop leeks and parmesan gratin, followed by rose risotto. For the third course, choose between wagyu and lobster tail with truffle mashed potatoes or cod paired with pink peppercorn vinaigrette and celeriac-maple puree. Then, couples can finish the meal with an assortment of mini desserts. This Valentine’s Day, induldge in Tanuki’s Omakase menu for two. Executive Chef Sergio Rivera’s menu additions include Amuse (oysters with ponzu and asian pear), From the sea (sashimi, king crab ceviche, toro tartar), From the forest (warm Japanese mushroom salad, sweet miso, yuzu, shiso), house selection of Dim Sum, From the farm (short rib hot pot, tangy red miso, mountain vegetables), and a coconut chia mango pudding. For the consciously uncoupled and coupled alike, Basement is offering complimentary slushies and ice skating all night on Valentine’s day from 5 pm to close. Ladies can celebrate with $5 glasses of Rosé, $5 Gem & Bolt Mezcal Shots, and $75 bottles of Moet Brut Champagne. Spend Valentine’s Day at 1Hotel, where you can indulge in Love Hurts and Have I Told You Lately cocktails at Habitat. 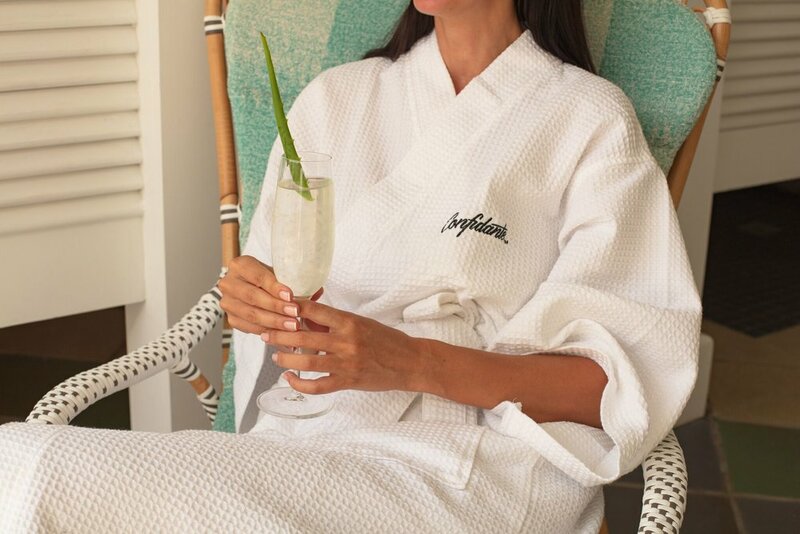 Then, head to the Bamford Haybarn Spa at 1 Hotel South Beach for a two-hour Valentine’s Spa Package. The experience includes a 50-minute Aromatherapy massage and a 50-minute custom organic facial. For a limited offer throughout February, every package booked will receive two glasses of bubbles and chocolates. if you’re looking for a more budget-friendly alternative, head up to the rooftop at Atton Brickell for the Valentine’s Day edition of ‘Movie Under the Stars’ featuring Crazy Rich Asians. Each ticket includes a complimentary bottle of wine, paired to perfection with a 360 view of Miami. Spread the love over at Pisco y Nazca and Bulla during Valentine's Day week from February 11 - 17 where $1 of each cocktail sold will be donated to the American Heart Association. Limited edition cocktails include Bulla’s Hibiscus Mojito and Pisco y Nazca’s Casanova. So this Valentine’s day don’t settle for salad at dinner when you can have a steak smothered in onions, a rack of ribs, pasta with extra garlic, french fries with lots of vinegar, and a side of onion rings with lots and lots of sauerkraut.